Nicolas dreamed of becoming a coffee roaster, and I wanted to be a coffee entrepreneur. For the last 6 months, we had the chance to join Florent Gout from Esperanza Café and help him launch a roasting workshop in Barcelona. Nicolas roasted, I did the financial, communication and administrative work, while Florent developed a coffee school and a quality control activity. Here is our experience, condensed in the 10 steps we followed to open this roasting workshop. You have 2 options to learn : learn by trial-and-error, or follow a training program with a professional. Working as a roasting assistant can be a good option before launching your roasting workshop. Otherwise, you need to join a training session to learn and practice. But first, we recommend you get The Coffee Roaster’s Companion (Scott Rao), a good book to start roasting. Which skills do you need ? You’ll need to learn how to roast but also to analyze green coffee and cup coffee so you can buy your green coffee, create a roasting profile and identify potential roasting defects. How to find a good trainer? Design of the course: it’s interesting to pick a course that mixes cafeology, green coffee analysis, sensory and roasting, as you’ll have a more complete overview of the industry afterwards, condensed in one or two weeks of training. We also recommend you do the training not too long before you start your activity, so that you have everything in mind when you start! Option 1 - A well located place in a busy area: more traffic, but a more expensive rent. You may have to open a coffee shop as well to make your place profitable, but then you may have to employ somebody else… You’ll probably do a lot of B2C in addition to your B2B activity. Option 2 - A place in a remote area: cheaper rent, more space, and no B2C activity (except if you develop an e-commerce website). In any case, you will need a smoke extraction. And don’t forget to look for food and health standards in your country, as well as administrative procedure. Feel free to ask us for any question about Barcelona! One of the most important steps! Know your competitors, their positioning and their prices, and study your potential customers to have an idea of the size of the market and their expectations. For a macroeconomic approach focused on the French market, we recommend reading the Xerfi report on coffee and tea. What level of quality would you like to offer? Would you like to have organic / fair trade coffee? Only pure origins or also blends? Which origins? Which markets do you target? Restaurants, cafés, grocery stores, companies, private individuals? What about your prices? ...These are some of the many questions you should ask yourself. You can also think about extra activities such as cupping and roasting workshops. For instance, you can register on Wecandoo to offer a “roast your coffee and go home with it” class! Feel free to contact us (contact.tostados@gmail.com) for more tips about the business plan and how to raise money. Al Grano is a good tool to source directly your coffee from the producers. You can also join Roasters United, a group of European coffee roasters that source their coffee directly from small producer cooperatives, to promote high quality coffees that are organically grown in democracy. It’s also a good option to start working with coffee importers as they offer a wide range of coffees, provide good advice and can deliver some coffees quite fast if they have them in stock. Just contact specialty coffee importers and ask for samples, and important information such as delivery dates, minimum quantities, possibility to have the exclusivity on such or such coffee, etc. Among the European importers, we can think about Collaborative Coffee Source (feel free to contact Nicolas: nicolas@collaborativecoffeesource.com), Nordic Approach, Falcon Coffees, 32Cup, Café Imports, Belco… you can find a more complete list here. How to choose your roasting machine? This article from Perfect Daily Grind gives 7 items to consider when selecting your coffee roaster. The coffee roasters brands we often hear about are Probat, Loring, Giesen, Diedrich and Toper. You can also check HB coffee roaster, an unknown but qualitative brand. Feel free to contact Luka from Kraft Und Werk for insights (kraftundwerk@yahoo.com). An espresso machine to taste your coffee in espresso! A Lighttells coffee roast degree analyser to compare the roast level outside and inside the coffee beans. And don’t forget to check the next coffee events in your country to be part of it! Meet your potential customers and start selling your coffee, even if everything is not 100% ready. Thus, you'll have a better understanding of your market and how you can adapt your project. It can be useful to get a small espresso grinder such as the Eureka Mignon, so you can visit your future clients and make them taste your coffee on their espresso machine without having to empty their grinder. 10. Open your roasting workshop! And get featured in The Coffee Vine box! If you have any suggestion or comments about the article, feel free to contact us at contact.tostados@gmail.com! You plan to open a coffee shop, a restaurant, a food truck, a bakery, a hotel, a company in Barcelona, or you’re just a coffee lover, and you wonder where to buy your coffee? You’re looking for the best coffee roasters, offering quality, third wave, specialty coffee, or whatever you call it? 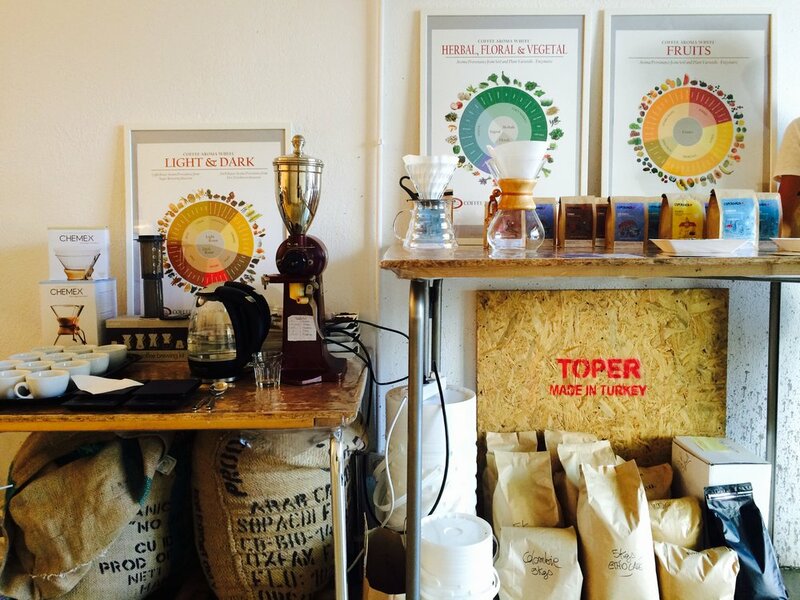 Here is our short list of Barcelona’s best coffee roasters, tasted and approved! Café de Finca opened in 2009 in Castelldefels, close to Barcelona. You can taste their coffee in their own coffee shop in Castelldefels, but also in different places in Spain. They seem to have a passion for cyclism, as you can also find their coffee in Orbea Campus Barcelona and Galileo 70 in Madrid, a meeting point for cyclists and coffee lovers! Special feature: cyclism & coffee lovers, you found your place! El Magnifico was one of the first actors to start offering quality coffee in Barcelona. They have been roasting coffee in the heart of city since 1919! You can taste their coffee in their roasting workshop / take away shop in the Born. Special feature: they also sell tea under the brand Sans&Sans. Esperanza Café is a micro-roastery focused on organic specialty coffee. They have been roasting in Paris since 2012, and they just opened a brand new coffee lab in Sant Antoni, at MOB&PAU. Esperanza Café is part of Roasters United, a cooperative of independent roasters who import coffee directly from small farmers cooperatives. Together, they promote high quality coffees that are organically grown in democracy. Esperanza Café also opened a Coffee School to train professionals and individuals to green coffee analysis, cupping & roasting. Special feature: Esperanza is the only roaster to offer 100% organic & fair trade specialty coffee in Barcelona! Hidden is a coffee roaster that opened in 2016. You can taste their coffee in their coffee shop, and enjoy their great selection of teas, in which they also specialised. Special feature: you’ll taste their filter coffee in a wine glass, nice experience! Special feature: Nomad Everyday offers nitro cold brew, have a try! Right Side Coffee is a specialty coffee roaster based in Castelldefels, close to Barcelona. It is well established in Barcelona, lots of coffee shops and restaurants serving their coffee. Special feature: they don’t make blend, as they prefer to offer single origins from coffee farms with which they try to maintain long term relationships. SlowMov is a coffee roaster that also promotes local products, share economy and artcraft. They offer different kinds of products in their shop located in Gracia: beers, honey, cheese all made by local producers, and coffee of course. SlowMov sources its coffee through Coutume, a French roaster & coffee buyer. They roast it in their workshop in Gracia, where you can have a café latte while admiring their Giesen roaster. Special feature: this year SlowMov was the official coffee provider for Catalonia and Spain Aeropress championship! And this means a lot about their work! Poble Sec is one of my favorite districts in Barcelona. Between the verdurous parks of Montjuic hill and the animated streets of Sant Antoni, Poble Sec reminds me a little bit of Montmartre. But until recently, I did not know where to get good coffee there... Yet, a few months ago, I came across this little take away coffee shop and I knew that it was exactly what was missing! Pimienta Café opened in November 2016, in the quiet Carrer de Radas, close to one of my favorite organic bakeries, la Fabrique. Kassio is the owner & barista of Pimienta Café. As a Brazilian who grew up in a family of coffee farmers and roasters, he has always dreamed of keeping the tradition alive! Kassio grew up in Brazil. His grandfather had a little coffee farm, and his father is a coffee roaster in the city of Monte Carmelo, Minas Gerais. Kassio has always wanted to follow the family tradition and become a roaster himself. But to start, he decided to open a coffee shop. He discovered Barcelona when he was younger and fell in love with the city. A few years later, he opened his café. If everything goes well, his dream is to start roasting one day and offer his own coffee in his coffee shop. What kind of coffee can you find at Pimienta Café? Kassio started with Right Side Coffee roaster, and keeps on serving their coffee as his coffee shop grows. But he also gets coffee from other roasters to make people discover other origins and roasting styles. He sometimes has organic coffee from Esperanza Café, but also coffee from Puchero, or even coffee from Brazil brought here by his family! When I visited him, Kassio prepared an AeroPress for me with natural coffee from Ethiopia, Sidama, roasted by Esperanza Café. Three months ago, a new coffee shop was born in Barcelona! Inspired by the atmosphere of Dalston, this chill district of East London, Borja opened Dalston Coffee in the Raval. We discovered it while we were strolling in the heart of Barcelona, close to the cute Plaça de Vicenç Martorell. Because there are not so many places where you can find a really good coffee here, we were very excited to discover this new born coffee shop and chat with Borja to know more about his story. Borja is a Chef. Before diving into the coffee world, he has been working for several renowned establishments. At this time, he didn't really know about specialty coffee. He discovered this world after tasting a flat white in London. That very moment, he realized he was drinking something really different, a new drink actually. As a Chef, while he knew quite a lot about cooking, pastries and wine, he realized coffee had always remained quite a mystery to him. From this moment on, he got passionate about specialty coffee and built his project: open a coffee shop in his home town, Barcelona. What kind of coffee / tea can you find at Dalston? Borja only works with specialty coffee. He currently uses coffee from Nomad for the espresso and filter, as well as organic coffee from Esperanza Café for filter. As for tea, he chose to work with Masala, that offers a great selection of fine teas. What we loved down there? The talents of Borja as a barista, so fast to prepare an amazing café latte to take away. But also the cold brew, really sweet and balanced, with ice cubes made of coffee. Pretty clever! How can you tell my coffee tastes like a pineapple and not just...coffee? “I really started to get interested into specialty coffee when I discovered cupping”, Charlotte once said. The development of specialty coffee* paved the way for a new tasting universe : coffee cupping, as complex and fascinating as wine or whisky tasting. For those who are still skeptical about it, you should know that coffee emits a combination of 1000 different volatile compounds… So when your roaster tells you that his coffee reveals notes of leather and dark chocolate with a hint of coriander, he’s not high, he really knows what he’s talking about! The first tool that will help you learn how to cup coffee is the Flavor Wheel. The Flavor Wheel lists the most common flavors you may find in a cup of coffee. Most professional cup tasters use it to identify quickly the flavors while tasting, thanks to the colors. The second most useful tool is the Nez du Café: a box containing samples of flavors like butter, clove-like, pipe tobacco, apricot that will help you train your nose. Cupping is an amazing experience that consists in evaluating the organoleptic characteristics of a coffee. Almost all your senses are implied! Taste (to determine the balance between sweetness, bitterness and acidity), smell (to identify flavors), touch (because you need to qualify the mouthfeel and body of the coffee), and sight (to evaluate the color of the beverage and its transparency). Concretely, cupping consists in loudly sipping a small quantity of coffee (with the typical “slurp” noise) in order to spray droplets of coffee in your mouth and make the volatiles go up into your retronasal cavities. The idea is to identify the flavors (also called aromas) of the coffee. this article from Perfect Daily Grind. * What is specialty coffee? Roughly speaking, specialty coffee is high quality coffee having very few defects, produced with care from the cherry to the roasted bean, and recognized for its flavor qualities. But be careful, specialty coffee does not systematically mean that the coffee is hand produced or hand roasted, that it is organic or that the farmers are decently paid... Be curious and ask your roaster!